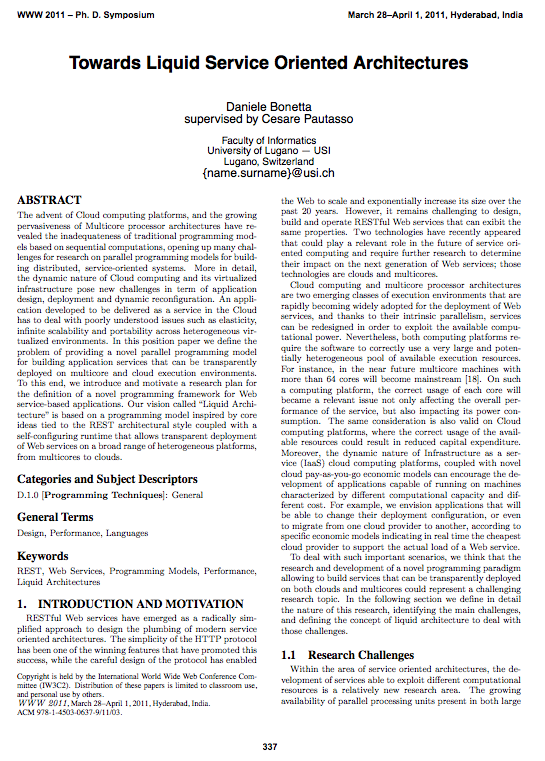 The advent of Cloud computing platforms, and the growing pervasiveness of Multicore processor architectures have revealed the inadequateness of traditional programming models based on sequential computations, opening up many challenges for research on parallel programming models for building distributed, service-oriented systems. More in detail, the dynamic nature of Cloud computing and its virtualized infrastructure pose new challenges in term of application design, deployment and dynamic reconfiguration. An application developed to be delivered as a service in the Cloud has to deal with poorly understood issues such as elasticity, infinite scalability and portability across heterogeneous virtualized environments. In this position paper we define the problem of providing a novel parallel programming model for building application services that can be transparently deployed on multicore and cloud execution environments. To this end, we introduce and motivate a research plan for the definition of a novel programming framework for Web service-based applications. Our vision called "Liquid Architecture" is based on a programming model inspired by core ideas tied to the REST architectural style coupled with a self-configuring runtime that allows transparent deployment of Web services on a broad range of heterogeneous platforms, from multicores to clouds.